We offer the same high-quality manufacturing and responsive service for our additional equipment as we do for our cranes. Telescoping equipment is used to keep the initial erection at a safe low height and then telescope it to the desired operational height. This technique involves inserting extra mast sections with the help of a telescoping cage and is used when an extreme or increasing height-under-hook is needed. The equipment can be removed after use and is interchangeable between cranes erected on the same mast type. Wall-tie frames are used when the crane exceeds the limited free-standing height. Climbing equipment is used when cranes climb within the building, e.g. in a lift shaft. For this type of operation, a special bottom section is required for the mast. Climbing and telescoping are carried out hydraulically using fall-safe equipment. 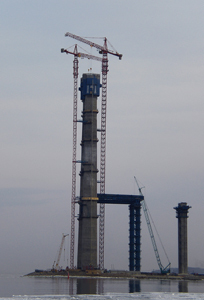 Base equipment can complement cranes to suit a range of varying site conditions. These cover expandable (cast-in) bases or base stools, tie-bolted down or freestanding bottom cross units, or rail-going travel bases with or without portals. Rail bases can be straight, 90-degrees, curved or, when required, a combination of these.